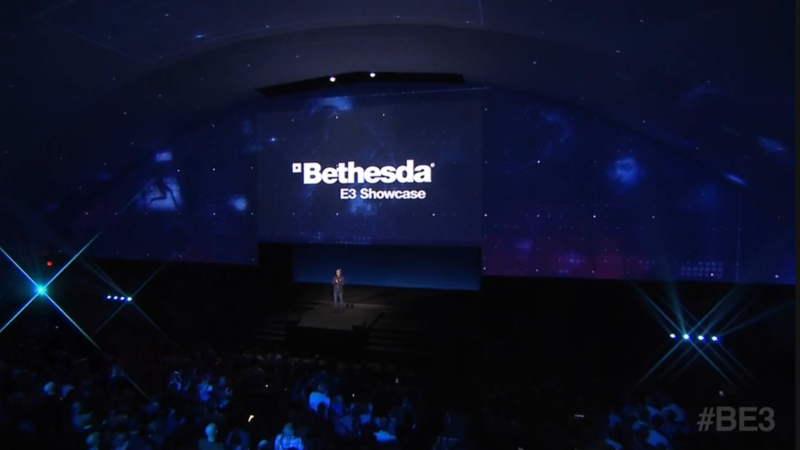 Opening the show with a Quake Champions trailer, Tim Willits of id Software explained that the new game will be a competitive arena-style FPS for the PC. It will be “fast” with “amazing graphics” running at 120Hz and unlocked framerates. They’re aiming for the eSports market at every level, supporting and expanding competitive tournaments and leagues. We’ll learn more about that at QuakeCon in August. Pete Hines told us that he is excited about this card game set in the Elder Scrolls universe. It’s coming to PC, iPad and iPhone. I don’t know why these three were lumped under the same video but here you go. Fallout Shelter is coming to PC in July 2016. There will be quests and stuff. Skyrim’s being remastered for PS4 and Xbox One and getting mods, wooo! Raphael Colantonio announced a new game from Arkane Studios – Prey. Looks to be set in space following what happens after the people in Prey got kidnapped by space aliens. That said, the trailer blurb describes it as “a first-person sci-fi action game that reimagines the franchise from the ground up… with an added psychological twist”. You can download the first level of DOOM on PC, PS4 and Xbox One this week only so if you’ve been on the fence about buying it, give that a go. SnapMaps will be updated with new features like Hell visual themes, new props, objects weapons and more. You’ll also get the option to create true single-player experiences. Sector – a capture-and-hold mode. Unto The Evil will be a new premium DLC pack, providing three new MP maps, a new gun, equipment item, armour sets, taunts and more. There will also be a new playable demon – The Harvester. Elder Scrolls Online is launching in Japan in 23rd June. The Dark Brotherhood DLC is coming to Xbox One and PS4. One Tamriel is a new initiative whereby all ESO characters will be automatically levelled to the content that you’re exploring. There will be no more restrictions on questing and you’ll be able to play with anyone. You can wander around the Hell section of DOOM in VR as well as Fallout 4 on HTC Vive. Harvey Smith, Co-Creative Director of Dishonored 2 introduced the game world trailer. It’s very pretty. Karnaka, “The jewel of the South” is the new, main setting, with very similar architecture to Dunwall of the original game. Dunwall will also be featured in the game. There has been a lot of emphasis on world-building, designing Karnaka so it feels like a place that people live in. The streets are designed so normal people have routes to and from work. Emily Kaldwin runs the Empire now. As announced last year, you’ll be able to play as both Emily and Corvo and each are fully voiced with their own emotional responses to events. In the game segment shown for Emily, you can side with the Overseers or the Howlers or neither. Much like the first game, there’s a lot of emphasis on choice. The demo showed her “far-reach” being used to pull a whale-oil tank from a distance. This can be upgraded to pull enemies towards you as well. Her mesmerise power puts enemies into a trance for a while, so they don’t even notice or remember when she walks past them. Her Domino power links NPC together so that when one person is affected by, e.g. a stun mine, so are all the others. Shadow Walk lets Emily creep along the ground as a shadow and execute people. While the demo mostly showed people being killed, you will still be able to finish the game without killing anyone. A second demo showed a time-piece that allows The Outsider to view an “alternate timeline” and switch into it at will to avoid or execute enemies. 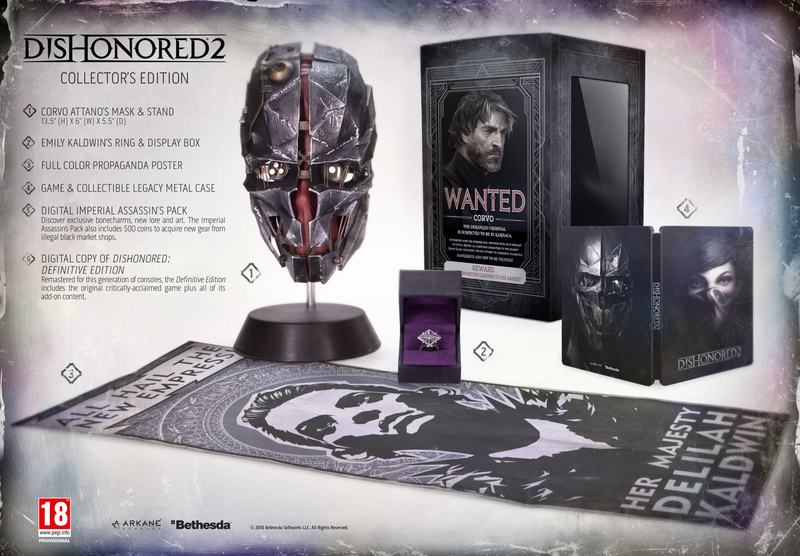 There will be a limited Collector’s Edition that comes with a replica of Corvo’s mask and Emily’s ring as well as a propaganda poster. Pre-ordering any version of Dishonored 2 will get you a copy of Dishonored: The Definitive Edition, as long as you preorder in the limited (and unspecified) time window. Update: In the DOS-like video run at the beginning of the trailer, there was a listing for New_Colossus with no date next to it. Many are speculating that this refers to an upcoming Wolfenstein game. See Videogamer for more info.